Croatia vs. Gilas Pilipinas result on Fiba Basketball World Cup 2014 Match in Spain: The final score were 81-78, Croatia and Gilas respectively via overtime on Saturday, August 30, 2014. Croatia Wins over Gilas PH on a good fight on its first game in the FIBA World Cup in Spain. Team Gilas is ranked 34th in FIBA, on the first quarter Croatia take a lead of 6-points (Croatia-37 vs Gilas-31). The scores were close in the 2nd half, then Gilas took its first taste of the lead in the last 3 minutes of the 4th quarter when Jeff Chan hit all 3 free throws to make it 67-66 with 2:49 to go. At the end of 4th quarter the score were tie 69 after Krunoslav Simon (Croatia) scored a cold-blooded three-points shot. The Philippines had a chance to win it but Jeff Chan (Gilas) missed a 3-point attempt at the buzzer to send the game to overtime. 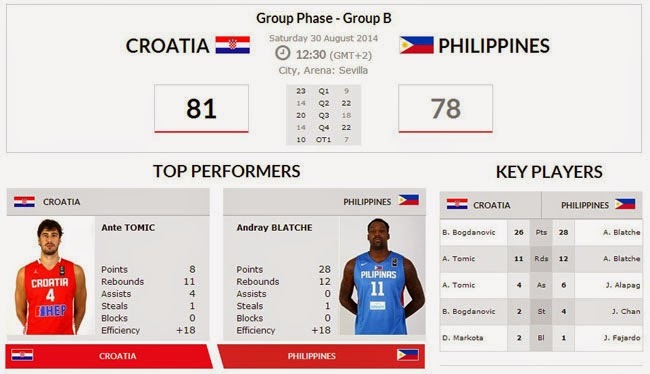 In overtime, Croatia shot better even though the score were close they beat Gilas PH with finals score of 81-78. This game marked the Philippines' return to the world championships after 36 years when they competed in the FIBA Worlds 1978.